In the style of a daily planner, “The Prayer Map for Women” offers a pleasant, easy-to-use guide for establishing or venturing further into a deeper prayer life. 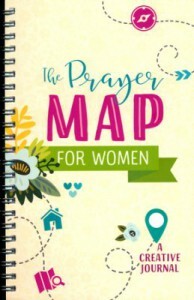 The first thing that I noticed about this prayer map was its conveniently compact size; it is lightweight and will fit in most women’s purses or bags for easy carrying. Also, because it is spiral-bound, writing in it is very handy, without having to hold the pages open; this is one of the first features I look at when considering any kind of notebook or journal. The pages themselves are whimsical and appealing without being ostentatious or detracting from its purpose, with magenta and teal illustrations. Two pages are allotted for each entry, divided into small, concise sections. Each page begins with “Dear Heavenly Father” and contains the following sections: Thank You For; I Am Worried About; People I Am Praying For Today; Here’s What’s Happening in My Life; I Need; and Other Things on My Heart That I Need to Share With You, God. The second page ends with “Amen. Thank You, Father, for hearing my prayers.” There is also a different Bible verse at the end of each entry, which grounds the writer in Scripture and encourages further reading of the Word. For women who are looking to jump-start, revive, or simply go deeper in their prayer life, this quaint little journal is the perfect guide!